Perry’s Jamal Whiteside, shown against Lima Central Catholic’s Jeremy Allen Jr. earlier in the year, is averaging 18.6 points a game, 3.7 rebounds a game and 7.8 assists a game. PERRY TOWNSHIP – After winning three consecutive Northwest Central Conference crowns, Perry took a step back last year and finished tied for second in the conference with a 5-3 record and finished the year with a 14-9 overall mark. But this year the Commodores are looking to reclaim the NWCC crown and face a tough test this week when they face Upper Scioto Valley Friday. Perry comes into the game with a 4-0 mark in the NWCC and 9-3 overall record and USV sports an unblemished 3-0 mark in the conference and a season record of 8-3. The Commodores’ three losses this year are to Shawnee (12-1), Wapakoneta (10-2) and Delphos St. John’s (9-4). The Commodores have gotten to this point on the strength of team chemistry, team defense and a little experience under their belts. The lumps the players took last year has paid off and the seniors this year were joined by a highly touted freshman group and the two factions seemed to have found some common ground. Returning to this year’s squad were seniors Jamal Whiteside, Louis Hoersten Martel White and Bradley Walker and junior Chazz Johnson. Joining them were senior Rashad Davis sophomore D’yonte Parker and a trio of highly touted freshmen Terry Riley Ryan Yingst and Will Knight. Whiteside’s 18.6 point average leads the team in scoring and is tops on the team in assists with an average of 7.8 assist a game. Jackson is second on the team in scoring and owns a 13.8 point scoring average. Tabler added the senior leadership has been tremendous. Recently, Tabler said he received what he considered was a big compliment when a parent told Tabler that she has was impressed with how the team supported each other and played together. Tabler asked her what she meant and she responded that when the junior varsity is shooting the varsity is their to support them and when one of the Commodores players hits the floor the other Perry players are quick to help him up. On the court, Tabler said one of the main strengths is defense. For the year, the Commodores are giving up an average of 44.5 points a contest and have held seven of their opponents to 50-points or less. In their last game, Perry held Riverside, who came into the game averaging 45 points, to 26 points. Tabler adds that this is still team developing and while they will have its hand’s full with a physical USV squad the Perry head coach said this is part of the process with room for improvement. Perry is riding a three-game winning streak and have given up an average of 36.6 points. 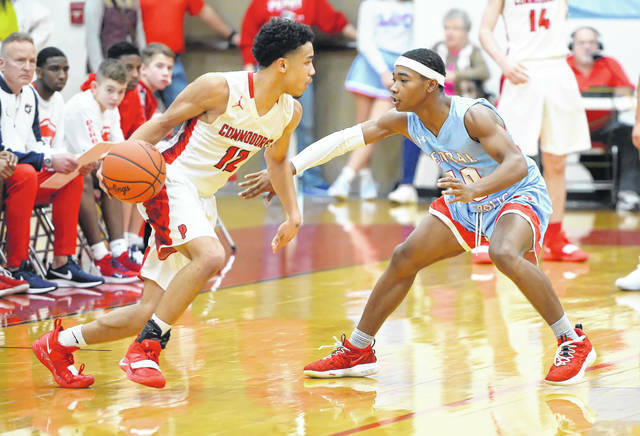 https://www.limaohio.com/wp-content/uploads/sites/54/2019/01/web1_Perry-vs-LCC-RP-007-1.jpgPerry’s Jamal Whiteside, shown against Lima Central Catholic’s Jeremy Allen Jr. earlier in the year, is averaging 18.6 points a game, 3.7 rebounds a game and 7.8 assists a game.